Today is the International Day of Happiness and the last day of Winter. 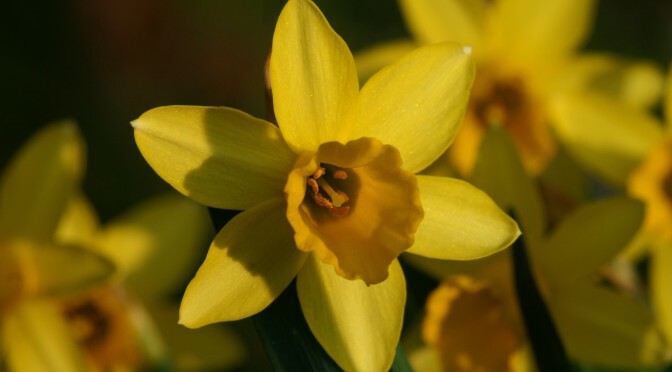 As far as I am concerned Spring has been under way for some time with the delightful daffodils and rays of Spring sunshine daily illuminating the view from my window into the woodland beyond. It’s been a rare day that has seen a solar eclipse coincide with the evening of the March equinox. An equi-nox, from the Latin, marks the moments in the year when the length of night is equal to that of daylight. It has long been considered a time of rebirth, fertility, and association with nature’s natural cycles. I’m not sure if feeling happy today is compulsory or not for the pessimistic glumguts out there. That said, when I was in my darkest depression and suicidal, I, also, ceased being an optimist. Indeed, as someone who suffers from a bipolar disorder – cyclothymia, it is all I can do to stay on top of my mood swings, and near impossible to influence them, just manage them. If anything, my moods are like the weather, sometimes clouding over, or then all of a sudden the sun breaks out, and then it pisses it down! Rapid cycling change. 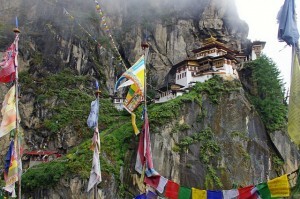 I do believe that, at times, one can think oneself happy – or content, at least, despite the surrounding circumstances. For, whatever may be done to the body, the mind is our last refuge and sometimes the greatest place of anxiety and attack. Yet, if we can calm that, then we may find peace amidst the storm, and internal sunshine in the darkest winter. When we can’t control the weather – as with the disappointing solar eclipse today occluded by clouds, or our finances, someone else’s love, or our government ministers – when democracy seems to have failed us, what is left that we can control? Where can we find comfort or hope, when we feel powerless? Is depression, which can affect 1-in-4 of us, something we can in any way lift ourselves out of? Depression is not a choice! I remember, all to well, the well-meaning suggestions “to get out more”, “do some exercise”, “get out of bed”, “get some sunshine in your life” given to me when I was suffering excruciating depressive lows and suicide attempts. The advice was not well received, when one feels the weight of the black dog suffocating your very breath. Shifting the circumstances and chemicals that affect depression is hard enough when well, nigh on impossible when ill. Yet, I do believe that, to some extent, we can think ourselves well, improve our state of mind and body. But I am not saying that it is easy or guaranteed. For me, I had to come off anti-depressants to even try it, and that is not something I would medically advise, nor am I in a position to. My path is my path. It unleashed in me, instead, a bipolar rollercoaster, which has become more manageable through daily awareness and diarying, in which I feel both more alive and yet when I have lows, at least more conscious of the possibility and experience of change. Every day feels like a new day, at last, it could go up, it could go down, but at least it could go somewhere! I’m a bit stubborn at the accepting of that which I cannot change and like to think in mental messianic terms of being able to do anything. It doesn’t always work, but sometimes I can shift my thinking and mood, or at least my attitude to it. 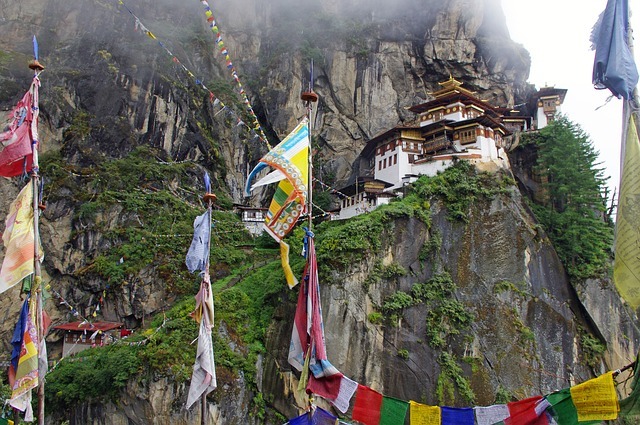 Since the early 1970s, one country – Bhutan, has recognised happiness as a goal over and above national income and actually adopted the goal of Gross National Happiness over Gross National Product. Here in the UK, we have a an HPI (Happy Planet Index) score of 47.9 and rank #41 of all the countries surveyed. Our wellbeing score of 7 is actually ranked #19 of 151 countries but we are let down by our poor ecological footprint on the earth. Over the years we are apparently getting happier, living longer, yet also remain anxious. Not surprising, in these austerity times, and I deeply suspect the UK measures of wellbeing. “Life, Liberty and the pursuit of Happiness” are a well-known objective and unalienable right in the United States Declaration of Independence. 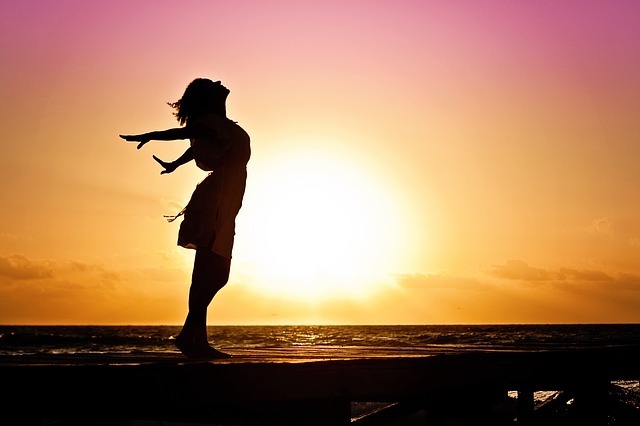 Sadly, we are only guaranteed the freedom to pursue happiness, no one can give it to us, they can certainly reduce the factors that make us unhappy – health, wealth, peace, among others, but at the end of the day, happiness can at best come from ourselves. As a boost to the chemical enjoyment of something akin to happiness, we can of course enjoy more hugs and the oxytocin they release, and draw some Vitamin D from the increasing daily sunlight. Certainly, I feel an enormous improvement to well-being after some light gardening and having the sun beat down upon my back. I spent my day, in the end, weeding, cleaning up around the already fast growing rhubarb, discovering some small over-wintered potatoes in the ground, and taking great pride and pleasure in how the warmth has pushed the asparagus above the surface already. It was also an opportunity to have some fun with a new lens adapter which enables my old 1978 50mm f/1.2 Minolta MD Rokkor-X lens to work on modern digital bodies (effectively a 75mm portrait lens on digital). The old lens is superb, and been described as producing a “complete bokeh creamy-mosh” i.e., a lovely aesthetic softness to the out of focus zone just beyond the shallow depth of field sharpness when the lens is wide open. Boke is a Japanese word meaning blur or haze. The lens is still worth £300+ because of the aperture brightness, and it would have been a waste not to find a way to reuse it – I used to use it for low light rock photography in black and white 30 years ago. Aperture priority and manual only but hey it feels like old school photography again, just without the expense of film and with all the immediacy of digital results. 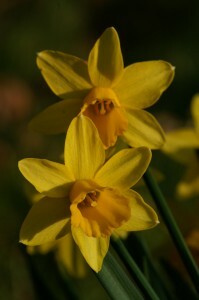 Daffodils of many varieties are out in my garden and surrounding woodland. 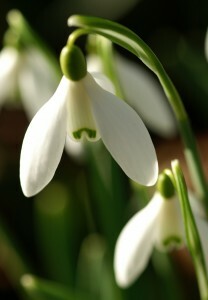 They are said to symbolize rebirth, new beginnings, and are pretty much the first Spring flower. Whilst I’ve always seen the humble snowdrop as a winter plant, to me it marks the halfway point of winter and the daffodil (narcissus or jonquil) as denoting the end of winter. In Wales, China, and as gifts, daffodils – in a bunch, are said to be harbingers of wealth and happiness. Happiness can be found every day, in the simple things, the asparagus and photography, weeding and sunlit warmth, the cats playing in the garden. They may not cure a low mood, or persistent depression, or solve financial stress, or bring about world peace, but in the present moment, they are to be enjoyed for what they are, and may bring a temporary boost – and I’ll take as many successive boosts as I can get!